Looking at petroglyphs always brings up questions about those who created them, the way in which they were created, and why they were created. Here are our questions while observing the sun's shadow move through the spiral petroglyph at Una Vida at Chaco Canyon, near the spring equinox. 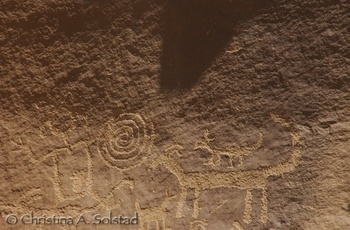 The photos are of petroglyphs on the cliff face up behind Una Vida, near the Visitor Center. 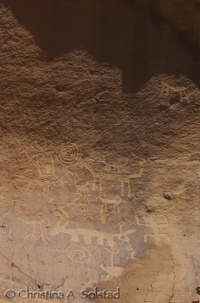 By observation over these three days, we guessed it was the top edges of the rock face on which the petroglyph sat. Was it already that way naturally, or did they modify the rock to more perfectly align? Look at the top right portion of the rock, just below the blue sky, and the shadow below, in the first photo. 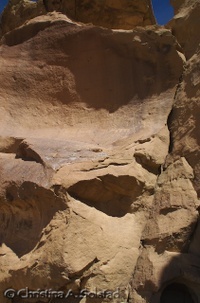 The petroglyphs are in the middle right of the smooth rock face. What was their process for creating the spiral, in relation to the movement of the sun? Were the petroglyphs already created, and the movement of the sun's shadow on the spiral at equinox was a coincidence, and they perhaps modified or added to the spiral (and perhaps the rock above) as a result? Did they observe the sun first, and create the spiral once they saw how and when the shadow moved across the rock? How did they create these pecked drawings in the rock, in days when there were no such things as erasers or the delete key? Spring Equinox: Una Vida Spiral Petroglyph - A Marker? Chaco Canyon is full of possible archaeoastronomical markers and alignments. One is a spiral petroglyph on the rock face high above Una Vida, an unexcavated site accessible via a path behind the Visitor Center. I accompanied G.B. Cornucopia, park ranger, and Elizabeth and Amy, writing professors from Kansas, to watch the noontime sun's shadow move across the spiral for three consecutive days around spring equinox. Elizabeth is helping do some research regarding the various markers at Chaco and elsewhere, so this was of particular interest to her. The photo above with G.B., Amy, and Elizabeth shows the petroglyph we were watching, far up and to the right on the cliff face behind them. We took successive photos to note the movement of the shadow from the lower left, through the spiral, and off to the upper right. To give you some perspective, the time between the two closeup photos of the petroglyph is 11.5 minutes. Each day it looked a little different in position and sharpness. But we all agreed it certainly could be an equinox marker. The movement through the center of the spiral was unmistakable. The Chacoans could have tracked the movement and used it to determine time to plant, when the days would begin to be longer than the night, and so on. 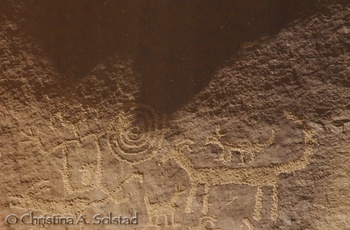 What caused the shadow that moved across the petroglyph? What was their process for creating the spiral petroglyph in the rock, and ensuring it related to the movement of the sun? What about all the other designs on the rock face? What did they mean? More on these questions in the next post. 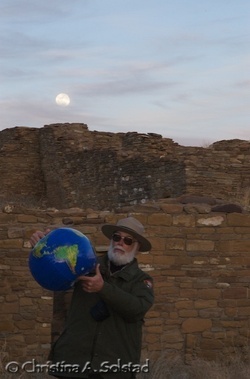 The equinox full moon walk at Pueblo Bonito inspired several examples of why the Chaco park rangers do what they do. 1. During the evening, Briana, a volunteer ranger at Chaco for several months, exclaimed how wonderful it is to see so many happy people (there were 80!). I understood, because I felt the same way when I volunteered for the day on summer solstice the past couple of years. How great to be doing something you love, and seeing others happy as a result! 2. G.B. Cornucopia frequently receives little gifts, especially from children. Paloma, an adorable young girl around 4 years old, gave G.B. a thank you note written in crayon, which promptly went on G.B. 's refrigerator. After the equinox moonrise evening, she presented G.B. with another drawing. She explained, all by herself (no adults involved), that it was a picture of how the sun goes down, and the moon comes up. Another prized piece of art for the refrigerator. She totally got his kinesthetic astronomy presentation. That, he said, is why I do what I do. 3. John has been a park ranger at several parks over the years. He shared that while watching G.B. at Pueblo Bonito, and the faces of the crowd of visitors hanging on his every word, he remembered (with some emotion) why he became a park ranger in the first place. As a teenager visiting Mesa Verde with his parents, he was enthralled by a ranger's presentation. He decided then that he wanted to do what the ranger was doing. 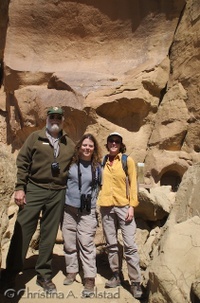 The park rangers at Chaco are there because they love what they do. Many thanks to all of them! This rare event occurs only a handful of times during the year, and with the full moon on equinox, it was perfect. This was my first time, and I was thrilled! I had butterflies in my stomach as I walked up to the pueblo at this late hour. Eighty of us (80!) 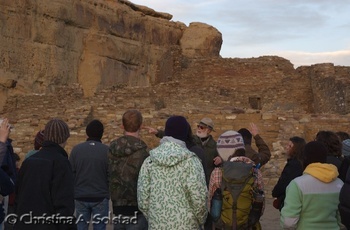 gathered at the southwest corner of the largest Great House in Chaco Canyon to listen to G.B. Cornucopia, park ranger extraordinaire, discuss some of the building alignments with the cardinal directions and the sun, moon, and stars. We tried to imagine the Chacoans living their lives there. As he spoke, the “sweet light”--that lingering light before sundown (and after sunrise) that makes everything glow warmly--began to dim. Photographers were in heaven, myself included. Clouds appeared--just enough to catch the sun's rays and spread color across the sky. The first glimpse of the moonrise took my breath away--a huge white-yellow ball appeared on the eastern horizon, lit by the setting sun. 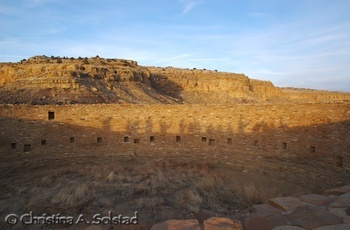 Sweet light made the pueblo walls glow. More photographer's heaven. 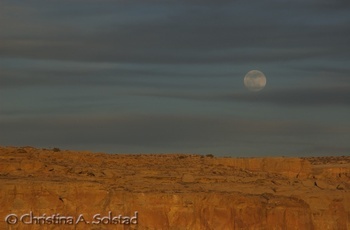 A brilliant full moon illuminated my 4-hour early morning drive from Santa Fe to Chaco Canyon. I arrived at Casa Rinconada shortly before sunrise on this glorious spring equinox (March 20). 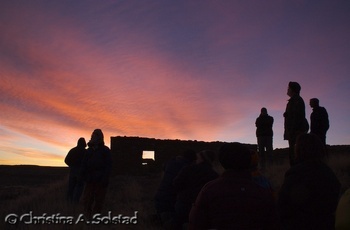 I bundled up, grabbed my camera, and joined 40 others, including several dear friends, gathered on the eastern side of the great kiva in the bitter cold morning air. A hearty crowd, indeed! G.B., a long-time park ranger, reminded us not to look directly at the bright rising sun for more than a moment - many have damaged their eyes in this way. Did the Chacoan sun watchers damage their eyes? Or did they learn to look away quickly? We listened as G.B. 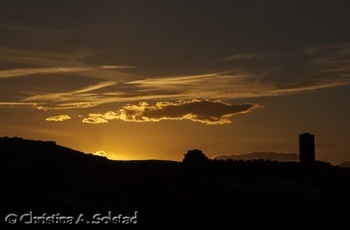 pointed out the cliff face to the east of Casa Rinconada along which the sun would rise, and explained several of the kiva's apparent alignments, including the two doors of the antechamber on the north side of the kiva that are aligned perfectly east and west. 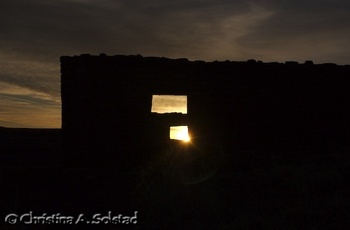 We moved to the western side of the kiva, where we watched the sun crawl up the cliff face, then shine along the cliff face and through the two aligned doors. This alignment with the rising sun only happens on the fall and spring equinoxes. The ancient Chacoans had the amazing ability to align their buildings with the cardinal directions. How did they do it? We could not do a better job today with all our modern technology. As astute observers of their environment, they were intimately aware of the movement of the sun and moon and stars. Closely watching the movements showed them the directions. Their survival depended upon their knowledge of nature's rhythms. We could learn much from their powers of observation, and their connection with nature. The equinox sunrise was spectacular, with pinks and oranges and yellows in bold strokes across the sky. More Chaco magic. What a glorious way to welcome spring!